The pea coat being made by Davide Taube at Gieves & Hawkes is slowly coming together. As with previous projects, we are approachng the design I had in mind wanderingly, through a series of fittings. No matter how much we discuss these things and Davide sketches a concept in advance, when we consider the piece in the flesh several presumptions come to light. Davide naturally cuts a pea coat quite big and boxy, for example, while I always want such coats as close as is practical. This is actually a second fitting, therefore, but it has simply been rebasted to a slimmer fit. The coat is made to fit over a jacket. It has slightly larger shoulders as a result, and is about an inch longer than a standard jacket. A pea coat is not as warm as an overcoat, but has other advantages, including being much easier to wear on the Boris bikes I often use to travel around London. Perhaps that makes it the modern equivalent of the car coat. Unlike other overcoats I have had made (including one by Vergallo, coming soon) the fit is not a compromise between covering a jacket and knitwear, and the half-belt at the back will not be adjustable either. Although dark navy in colour, the lines – particularly through the back – will add a lot of visual interest. Although of course they will not be as pronounced as below, with the white basting stitches highlighting the side seams and belt. We’re undecided on dark-brown horn or vintage brass buttons. As is often the case with buttons, the choice will radically change the look of the piece – it’s always something worth considering for guys buying suits or overcoats off the peg, for that reason. A couple of alterations and new buttons can make a world of difference. 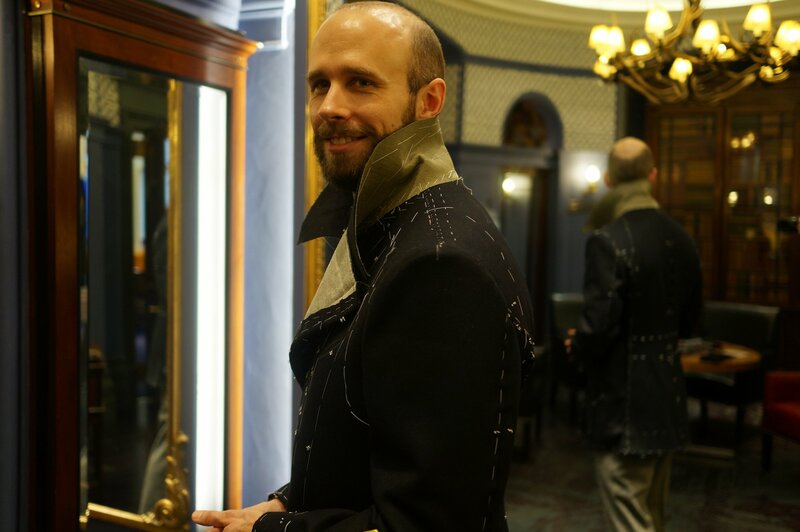 You can follow the discussion on The bespoke pea coat – Part 2 by entering your email address in the box below. You will then receive an email every time a new comment is added. These will also contain a link to a page where you can stop the alerts, and remove all of your related data from the site. A very nice garment. I believe it will also work very well in casual settings like when going out for a stroll in town. However a question. Does G&H also do bespoke shirts & ties? No, Gieves only does MTM shirts, and no bespoke ties. piece on buttons and where to buy them??? The best buttons for bespoke – nice horn etc, come from suppliers that aren’t usually set up to sell to customers directly. You can find sources online, but they are unpredictable. And trimmings shops, particularly in London for example, can be good but mostly for specialist buttons such as the antique brass I referred to. In my experience, the best way to source good buttons is to talk to your tailor about the various English, German and Italian suppliers, and get samples in. Your pea coat is coming together very nicely. I put 1950s vintage Italian horn buttons on my late 40s US Navy pea coat and I love it. I could imagine vintage brass looking very nice too, but I like how horn looks more civilian and less like something straight out of the navy. Simon, this is a general question unrelated to this particular post, but on your bespoke journey have you ever had something made which you looked back on & wished you hadn’t? 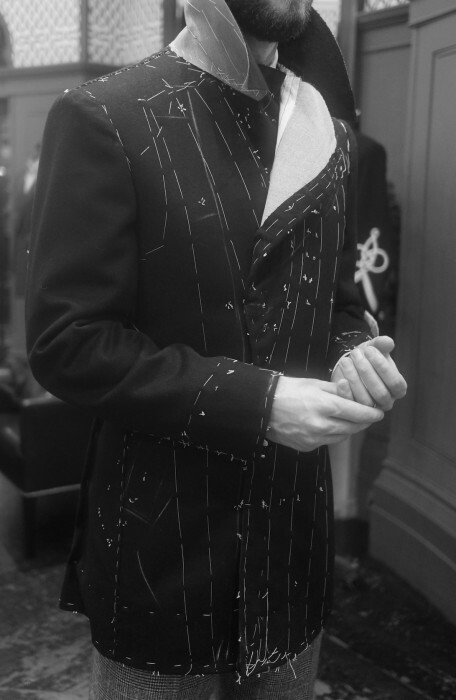 With the effort, cost and so on involved in bespoke clothes, there is much more cause for buyers remorse I think, which may explain why tailors have a rack with uncollected items I think. on buttons .. try benson and clegg in the arcade, lots of vintage type buttons.. Absolutely, though it’s pretty much always been a case of choosing the wrong cloth or wrong design. I shouldn’t have had an action belt and bellows pockets on my Huntsman tweed, for example, and the silk that my checked Vergallo jacket was made out of I really don’t like much any more. Too spongey. The other thing I regret is not spending more on suits – eg having lots of cheaper bespoke that I now don’t wear. But then you can only save up for so long. Thank you for keeping up the posts during the Christmas period. Did you consider a longer length or any other design choices (broader shoulders for greater reach) due to the occasional cycle? Thanks, I do try to be consistent! No, I didn’t consider any other aspects for cycling, as it won’t be used that much on a bike. If I had, though, the key things would have been a bigger pleat or side pleats in the back. Firstly, I echo Chris’s thanks for keeping this blog going over the Christmas break. On a unrelated but seasonal sales related note I was surprised to hear off someone that many shops now specifically produce cheaper versions of their high end products to discount for Christmas sales . E.g. Renowned shoe makers who use a cheaper leather for their discounted Christmas sale shoes. Another renowed US retailer based in UK who sells lesser quality stock at its outlet store . Are some of these high end retailers discounting stock that was never at the same quality or same price as there ‘regular stock’? I’m stunned at the revelation! I think there needs to be more awareness about this (naming and shaming?) . Very often the likes of myself with limited means would use the seasonal sales as a way of bagging these ‘reputable ‘ brand products. I understand the skirt part, but why “up into the armhole”? Not into the armhole itself, but to the point the side seam ends at the bottom of the armhole. The point is that the adjustment must be tapered slowly to nothing both up and downwards. Yes, my mistakes so far have centred on going for slightly wacky SC cloths, added design features which I now think are rather outré, all done in the misguided belief that as I was paying for ‘bespoke’ so I should jolly well make sure I was getting things which were ‘special’. The irony is by having loud and brash things made rather than ordinary everyday items (plain navy suits et al), you end up actually having a collection of things to wear for parties and special occasions but very little which looks sensible for business wear or just for a meal out with the missis! This is a very neat post. It is truly amazing what you can have done bespoke. I received the James Bond peacoat from Billy Reid for Christmas. I love it and I am always curious what other peoples interpretations of the ideal garment are. Happy New Year! I presume from the date that this was posted that the jacket is now finished. Is there any chance of “The bespoke pea coat – Part 3”? I look forward to seeing the finished result when it is finally ready. 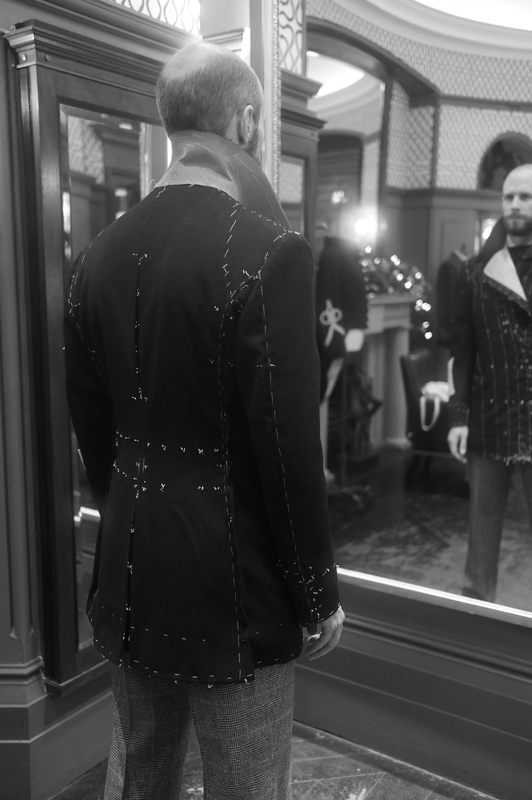 I am sure it will look amazing based on the cut and lines evident on the basted jacket in the photos. My record wait was 8 months for a leather jacket from Aero leathers. What’s your current longest wait? Just read your comment above about what bespoke commissions you regret, and you mention the cheaper bespoke suits that you no longer wear. Am I right in interpreting this as a reference to your Graham Browne suits? Do you find them that inferior to the more expensive stuff you have had made these days? They are certainly not up to the others from Savile Row or abroad, no. Thanks Simon. Is that in regards of fit or make? Thanks. Very interesting. So would you no longer recommend GB as a good bespoke value for money alternative? Many thanks Simon. Appreciate your reflections on this, as I would assume many of your other readers do as well. Do you still think so? What other non-Italian “soft tailors” do you currently like? Have you tried Steed Bespoke?